The serial number field is where you enter your serial number in order to activate the product. Some versions of Go Integrator will not show this option. From versions 3.0.12.18052 and later, pressing "Release" will release a license from the user previously configured in the username field. This action will make a license contained in the serial number available for another user. On release, the user will also be presented with an unlock code. Please just make a note of this and make it available to the support team if you have any issues registering the serial number on another device. Note: For versions prior to 3.0.12.18052 a license will not be released and a ticket must be placed on the support desk and the unlock code quoted before the license against the user can be released. Choose the protocol via which you want to communicate with Service Provider platform for call control. 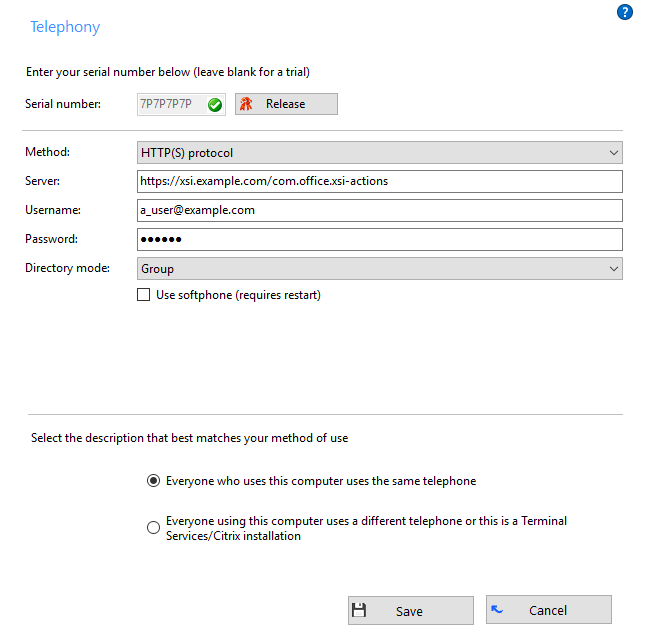 Enter your telephony server's URL address For rental model the XSP server address will be pre-programmed into Go Integrator Client and will not be visible. Enter your username and password (these will normally be provided by your service provider). Select the preferred directory mode which can be used to control the directory numbers you download from the telephone system provider. This is useful to improve the performance of the Presence window if you are part of a large organisation. By default it is set to Group and your group is related to your username. Selecting the Softphone option allows Go Integrator Client to act as a softphone. When used in this mode Go Integrator Client will not be able to control any other devices you may have connected to your profile e.g. a desk phone. You will also need to configure the Audio settings under the configuration menu. Softphone requires an additional license. †Some versions of Go Integrator either do not include or have modified implementations of this feature.